What's so great about Candy Wrapper Purses? What a silly question! First of all, we are talking about candy wrappers. What fun! Secondly, we are talking about purses. I know they say that diamonds are a girls best friend, but I think shoes and purses are right up there, don't you? When you combine the two - chocolate candy wrappers and a fantastic looking handbag - well, you know you are onto a real winner! I don't know who first came up with the idea of making recycled candy wrapper bags, but I have to give them credit - whoever it was. It's a brilliant idea; don't you think? The gorgeous color combinations that result from the clever weaving of your favorite candy wrappers make a really eye-catching pattern that you can't help but love. What's extra nice about recycled candy wrapper bags is that they are eco-friendly. I have to admit that I'm not a huge environmentalist. I've always made it a practice not to litter, and to do my best not to be wasteful, use recycled paper when possible, etc., but that's about as far as it's gone. As the years have gone by, I've become more and more aware of the huge amount of waste and refuse we create in our current era of disposable "everything." There's no doubt it has an impact on our natural surroundings. I don't think I'll ever go over the top in my eco-friendly ways, but I have to say, it's very appealing to know that you can get such nice results from recycling what would normally be waste and rubbish. Don't worry! These wrappers that make up the beautiful candy wrapper purses aren't dirty or smeared with chocolate (more's the pity). The wrappers are sourced from companies that have damaged candy wrappers for one reason or another. They haven't actually been used and licked clean! 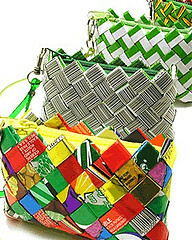 One of the top makers of these beautiful candy wrapper purses is Nahui Ollin. They have a nice range of inexpensive recycled candy wrapper bags to more glamorous (and expensive) candy wrapper handbags. Would you like to surprise someone special with a gift they'll really cherish? The whimsy factor alone will get you brownie points! Here's a nice selection of Nahui Ollin candy wrapper handbags and purses to choose from. They are bound to have something you'll love.